Sometimes I can’t get over how we get to see art for free, amazing ones at that too. That is one of the thoughts I had after seeing Ryoichi Kurokawa: unfold, at FACT, Liverpool. The 15 minutes 3-D video graphic piece is presented on 3 large screens suspended in a black box room. Kurokawa took data of Molecular cloud gathered by Research Institute into the Fundamental Laws of the Universe (CEA Irfu, Paris-Saclay), and turned them into an immersive cinematic experience. He made the observational and simulation data that the scientist used to determine how stars like our sun are formed, to something that has spectacular sound, and vibrates you. The bursts and changes in the galactic-data-cloud make the experience feels like being in a room where a very frantic yet systematic fireworks went off for 15 minutes with surround sound. Watch this trailer video using your headphones. The piece itself is already overwhelming, but the concept of using data of how stars form into an artwork is extraordinary, right? People were able to watch the piece for free Tuesday – Sunday, until 15 June at FACT. If you don’t get to watch it at FACT, I am sure that the piece will tour in different places just follow FACT social media for more details. When you do catch it, the piece is best enjoyed if you sit on the floor. Let me know what you think about it. Have you seen any similar pieces, where art is produced using scientific findings, data or even scientific experiments? I’d love to find more of these pieces. I was clearing out my MacBook from the unknown debris that is filling out my hard drive, when I found these. Photos I took for our Cultural Olympiad. Remember that amazing year filled with that heart warming activity that is London Olympics? Well for those who don’t know the Cultural Olympiad project started two years prior to the Olympics. Arts organisations and museums were participating in a range of activities, concentrating on exchange programmes. Ours was Truck Art. It was really fun for me. I did not only the marketing for the project, but also took these photos, made two videos, managed press, prepared and delivered the big launch. I thought what made it fun was that the young people involved in the production, pictured here are Ciara and Kiera, who learned techniques and the story behind the Pakistani artisan Haider’s work. The decorated Bedford truck is now a part of the museum’s collection. The Derby Museum celebrates their new nature gallery by running a fundraising campaign ‘Buy a Bird’. The idea is for people to donate by ‘Buy (ing) a Bird’- these are well designed vinyl stickers of different type of birds with your name/message at the bottom. The stickers are displayed on the walls of the staircases in the museum. People can donate either £25, £50, £150 or £250. The size of the bird depends on your donation. Why is this campaign a good idea and well executed? The link between the campaign and collection/gallery is strong. This means that people can both remember their ‘bird’ and the collection/gallery. I have seen campaigns of simply raising money, without raising awareness of the gallery, which if fine, but this one has a double whammy effect. The striking yet simple design of the birds. This one is possibly personal to me, but the geometric design of the birds feels quite current. Although, there is always a chance of the design being out of date. I can really see that if the design is not current, that the museum wall would look like it has bad wall paper. The design was made by a design agency called The Cafeteria from Sheffield. The leaflets supporting it are clearly written. They have almost all the important ingredients that we need to know as potential donors: What is it all about, what do people get out of it, and how does it help the museum? Hold on, why did I say almost? Well, the actual leaflet doesn’t show the available choice of birds. Why does it matter? Well think about the visitor journey – if you want to think about donating or buying as a gift for someone else, how do you remember what birds are available when you get home? Or maybe you can’t choose your bird? Another thing, that I think might be because of rules and regulations, or limitation of their website interface, is that you can’t donate online straight away, you have to download the leaflet, print it, and send it with a cheque to the museum. I didn’t think of this when I was there, but I wonder whether people get confused as to whether or not they are sponsoring/buying an actual bird. I think these are minor things, though, because the walls of the staircase of the museum are filled with stickers of birds. So, it looks like it worked. Whoop! Well done to Derby Museum. On twitter I was told by Andrea the museum’s Co-production Manager that the idea was inspired by Sheffield Millennium Galleries campaign of buy a butterfly. So, maybe I should go and check that out. What do you think? Have you seen any good and well executed fundraising ideas? P.S. I hope to send of the form soon. Can a Museum of Modern Art be Art itself? Have you ever been to the Winter Palace in St Petersburg Russia? Where you have to wear blue plastic bag over your shoes and there are gallery attendants (mostly ladies) wearing black suits in every room staring at you intently and following your every move. Barking at you if you are anywhere less than 1 meter away from the collection. I have been to several museums that have a similar standpoint in collection engagement as this, in Bratislava, Sofia etc. Most of which are museums with collections of classic art. In most modern/post-modern art museums that I have been to, there are always fun or interesting things to do with the art. In many pieces, people are encouraged to engage with the art, intentionally. Get closer to the art, inspect, take pictures, admire, feel uncomfortable and many other things that usually takes you out of your comfort zone. Modern and Post Modern Art usually challenges the boundaries of current acceptable states, constraints of society or culture and so forth. The very popular work by Duchamp ‘ Fountain’, for example. Making or turning an everyday object to art, in this case a urinal, I think breaks that boundary of beauty, or what is considered art. There are installations that are completely conceptual and rely on Humans and their engagement, like Hirst’s Twins, where he had twins (different sets, in one day there is 2 sets of twins) seating side by side and having to wear and do the same things at the same time. I saw this a few years ago at the Tate.The twins were told to interact with the audience.You are welcome to talk to the twins, but both of them have to talk to you, they have to mirror each other all the time, even when they go to the toilet, they have to go from their seats together. Obviously there are artworks where you are encouraged to touch, go through even climb on. 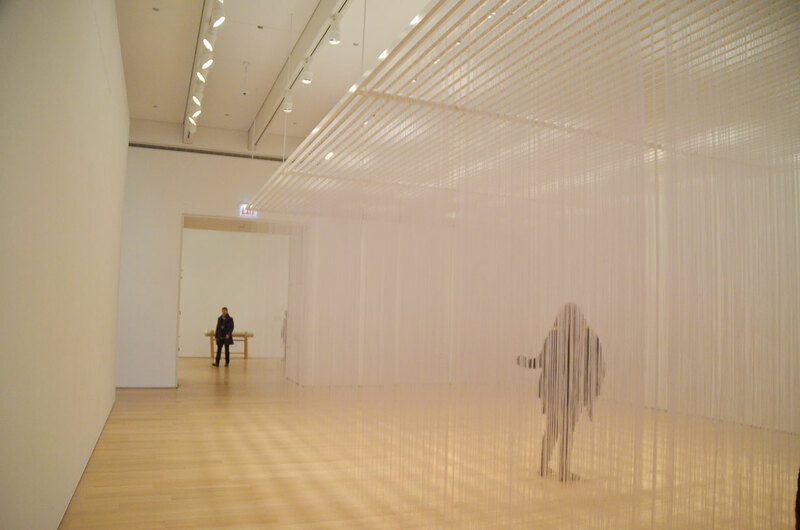 Or this piece by Jesus Rafael Soto, Penetrable de Chicago, I saw and experience at the Art Institute Chicago, where the installation is hanging transparent filaments. People are encouraged to go through to feel the changes of every movement. You know however, with these types of art you must be encouraged by the human with authority to engage, otherwise you never know whether it is what the artist meant it to do. Right? As in: is that a bucket or is it art? Can you touch it or is it a piece because of the shadow that it cast, so as soon as you slightly move it it changes. These types of art also always makes you raise a question, challenges you to think and feel differently. It does to me anyway. Is the whole museum a piece of artwork? Because it seems to be challenging the current status of Modern Art Museum, where engagement are encouraged. 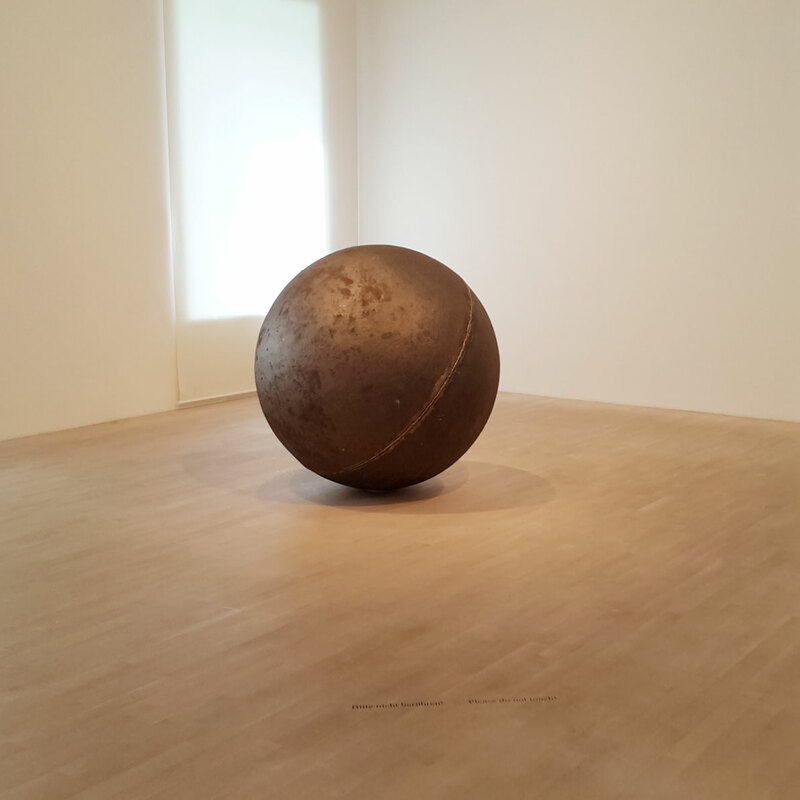 Contrary to other Modern Art Museum, it seems this one it is imperative to make you feel thoroughly uncomfortable, by having angry and disapproving looking gallery attendant in every gallery follow you around everywhere, like you might be there to steal a 3 ton ball of steel. There were a few artworks that we saw that I thought the artist might have intended more interaction with the audience but I am not comfortable enough to look closer, or even ask the gallery attendant. There were works where the artist clearly meant for audience to interact, such as a series of buttons on the floor that made various contraptions come to life, but the buttons were policed by a severe lady who issued stern reprimands to any who dared to try to engage with the piece by pressing the button. Even if you asked her to press the buttons for you, you got short shrift. Apologies for the wobbly picture, I didn’t dare linger. 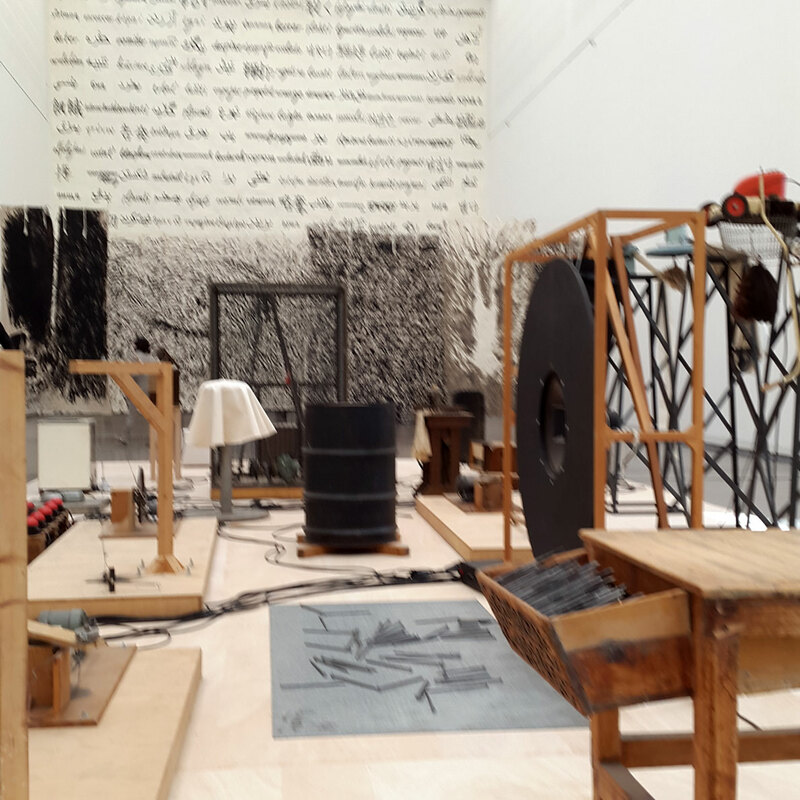 Are they trying to break the current status of Modern Art Museum? Is it transcending the boundary, a metaphor between Renaissance eastern block museums with Modern 21st Art Museum? I designed and directed the creation of marketing materials for local literary festival Wordfest. The need was to make the literary festival to be interesting, inclusive and striking. Hi, I am Jane. Having worked in Culture in the UK I think cultural experience is the most vibrant and colourful experience you could have. I also believe that culture and knowledge should be easily accessible by everyone.